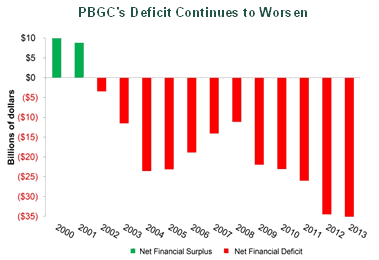 In 2011 we discussed the sad state of affairs at PBGC, the government agency responsible for bailing out private pensions (see post). Back then the debate centered around the bankruptcy filing by American Airlines and the fate of its pension. Now the agency is back in the news. Today's Bloomberg article discussed PBGC's dealings with the 2013 Hostess failure - the maker of twinkies who shared its pension with its supplier. Needless to say the supplier's employees went through some turbulent times. Many other sizable private pensions that pool employees of multiple companies (multiemployer plans) are also not doing so well. As PBGC takes on more failed pensions, its financial deficit - payments to pensioners offset by premiums it charges pensions - gets worse. And it will probably take all three - in addition to steady US economic expansion - in order to avoid any taxpayer involvement.